If you love getting to try out new nail polishes then I suggest you sign up for Julep’s Maven Program! I’ve been getting the boxes for awhile now ($19.99 a month) and have found that I love their polishes and hand products! I thought I would just do a quick post on what I got for the Julep Maven October 2012 “It Girl” box, and by all means if you’re interested go and sign up! I would love it if you did it via my affiliate link because I can then earn rewards. I’m all about reward systems! Once you become a Julep Maven, you get a personalized 20% code that you can use on any/all of your Julep purchases. 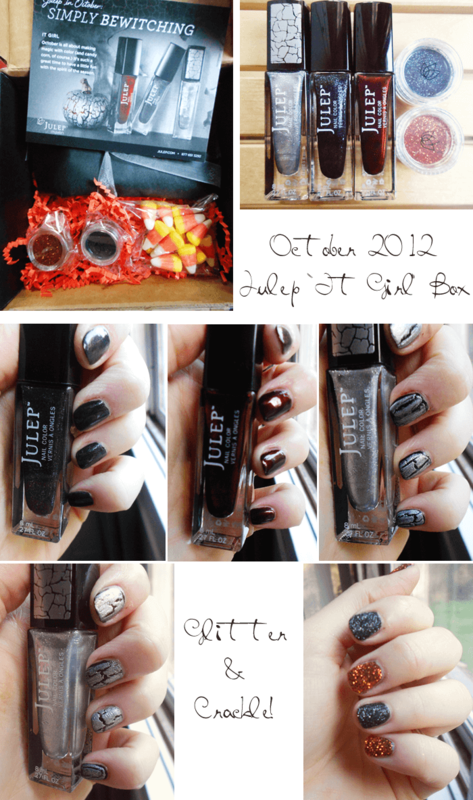 So this is what I got in October 2012 Julep “It Girl” box! Forgive the photos, I was using my point and shoot camera and wasn’t able to get the macro I really wanted so if you want a better photo of ANY of these polishes, please let me know! I loved ALL of these polishes which is surprising because normally I’m not a fan of crackle polishes. The formula was great on all of these, I was thrilled! I’m still wearing Caroline because it’s so gorgeous. It’s more of a blackened red and in the light is just… amazing. Leslie looks a bit dull so make sure to use a super shiny top coat. I received the same package and have to ask because I haven’t tried it yet – how do you use the nail glitter? Do you pour it on or dip the nails in or what? Do you need a top coat over the glitter? I totally love Julep!! I did a thin coat on ALL nails, then went back and did my second coat, dip into nail glitter pot, and repeat on all nails. I did NOT use a top coat for the swatches but you NEED to otherwise because it’s gritty and glitter falls everywhere. Oooh, love Julep, too! I really liked my October box, though I haven’t tried the glitter pots yet. They sort of scare me. Mine was the one including the auburn/brownish hue and the clear pink, which is really pretty. And I’m totally envious of your top shot! WOW, that is a lot of lovely polish.